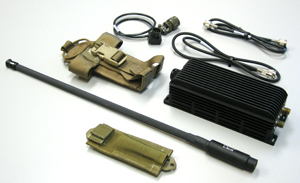 Small modern Tactical Transceivers often don’t have the output RF power necessary for dense urban or mountainous terrains so additional RF power amplifiers are needed to complete the mission. AR Modular RF offers a range of auto-tuning 30-512MHz “Battle Tested Communications RF Booster Amplifiers” specifically for this purpose. The design concepts have been honed over the past 10 years of manufacture and AR now offers one of the largest families of booster amplifiers in the world. Please click here for a white paper on its real world performance. These units are designed to carry not only FM and AM legacy waveforms but have been field proven to carry most proprietary and emerging JTRS waveforms, like SINCGARS, HAVEQUICK , HPW, SatCom DAMA, IW and the very latest networking formats like ANW2 and SRW. Both of these systems contain fully regulated power systems and can therefore be operated from batteries as well as 12 or 24V vehicles without compromising the RF output power. The AR-50 unit which was previously JITC certified for the Raytheon PSC-5D radio has now just completed a re-certification for the very latest Harris PRC-117G and offers LOS and SATCOM antenna ports, power level control and a switchable low noise amplifier (LNA) with additional SatCom co-site filtering all in a highly compact and rugged housing. AR's catalog of tactical product offerings cover output powers from 20W to 200W which all come with a 3 year warranty.